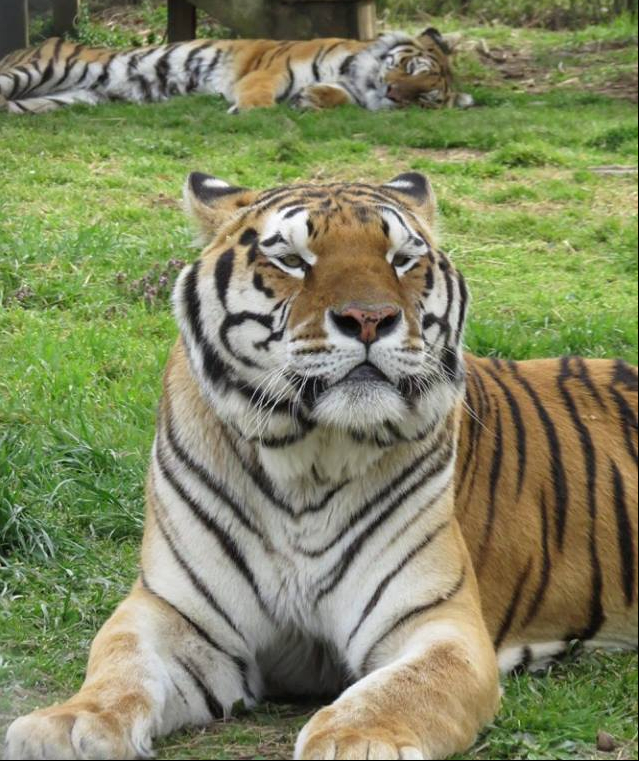 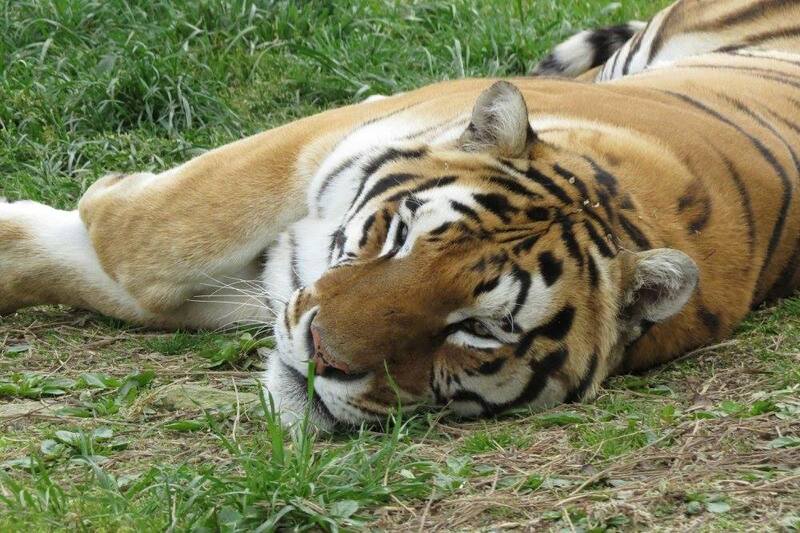 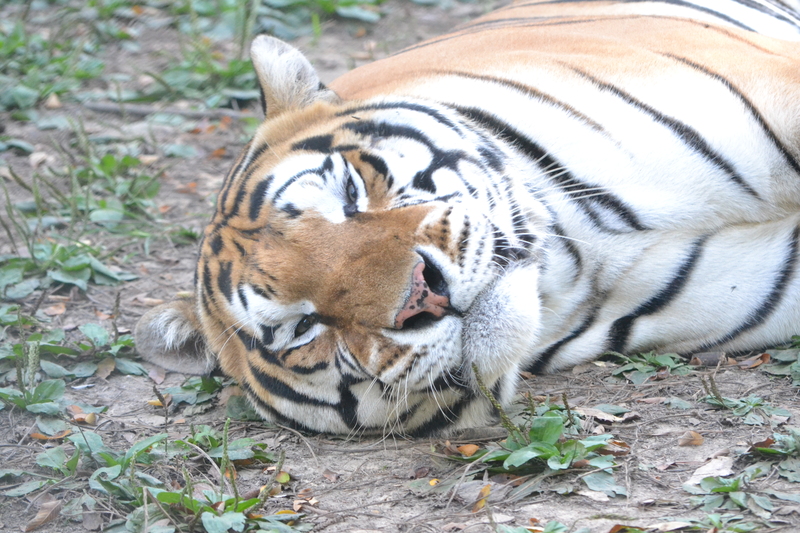 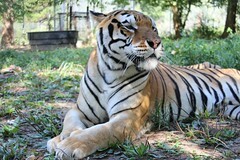 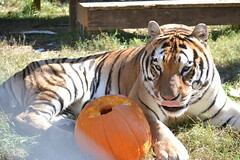 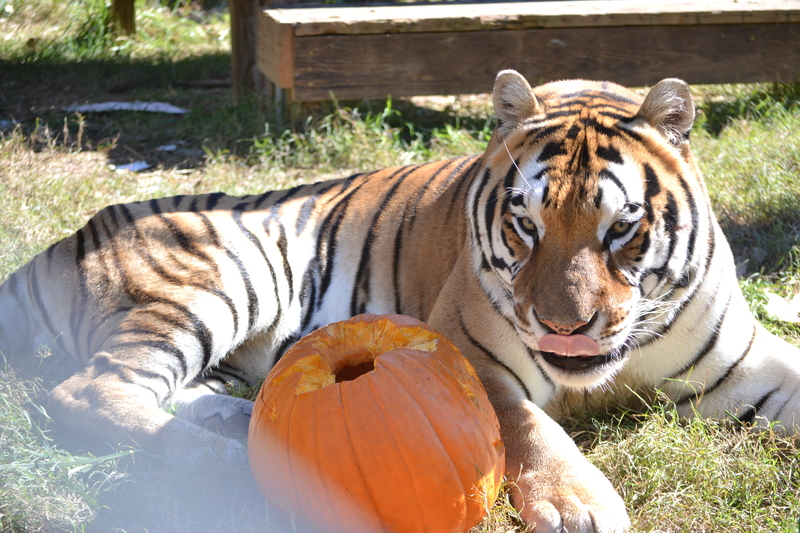 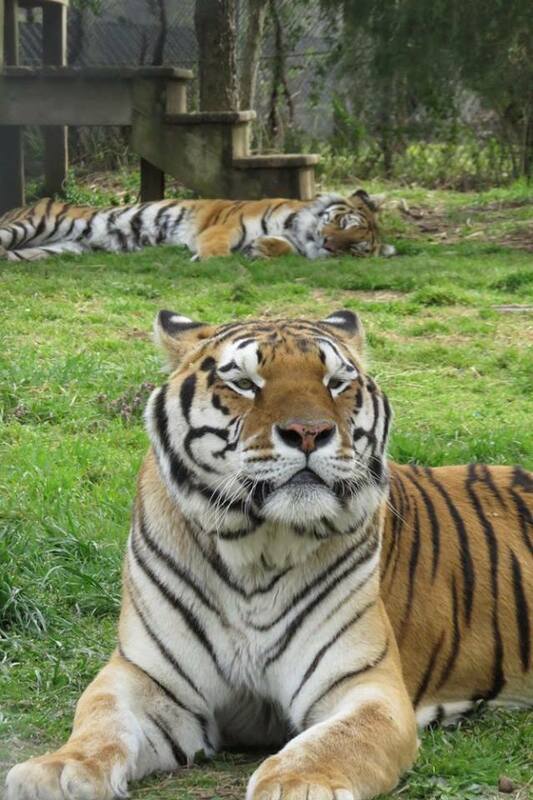 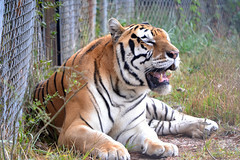 Caprichio is our largest tiger at Carolina Tiger Rescue. He weighs 478 pounds and it is all muscle! 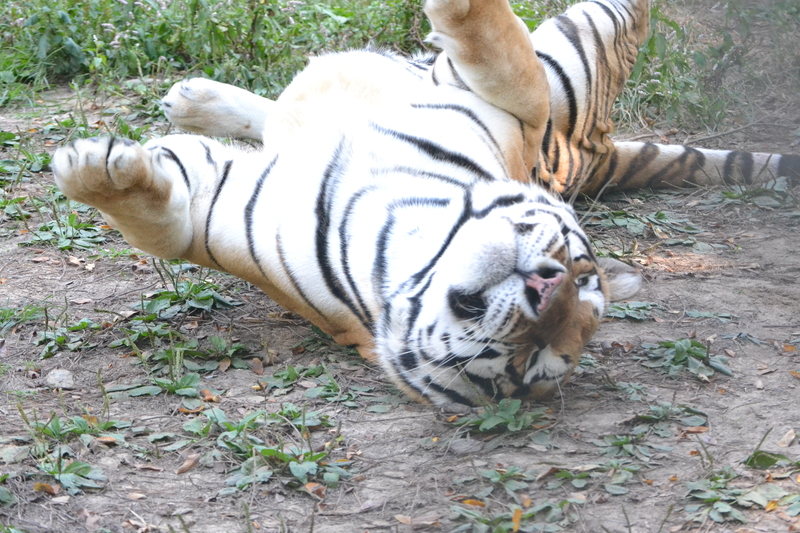 This big boy takes time to get used to things. 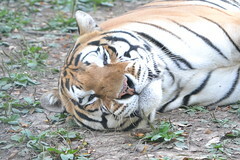 However, once he warms up to new experiences, he is as relaxed as can be. 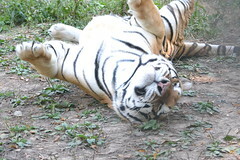 He also loves attention from passersby. 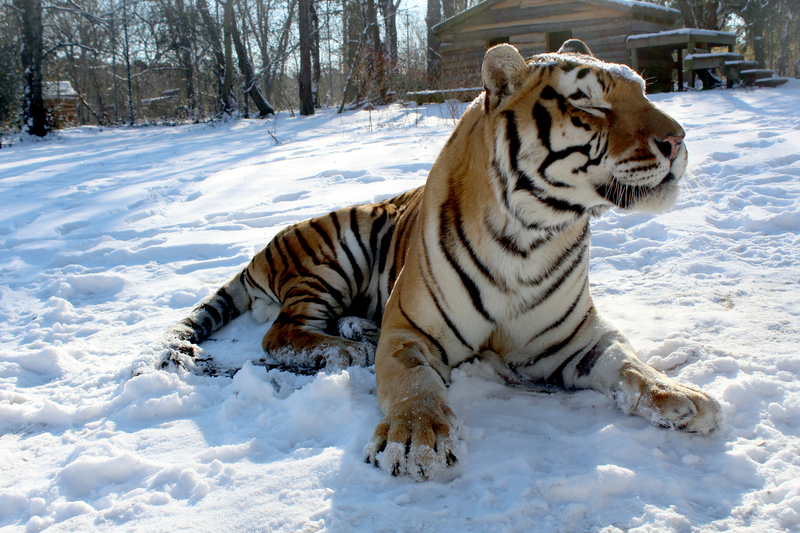 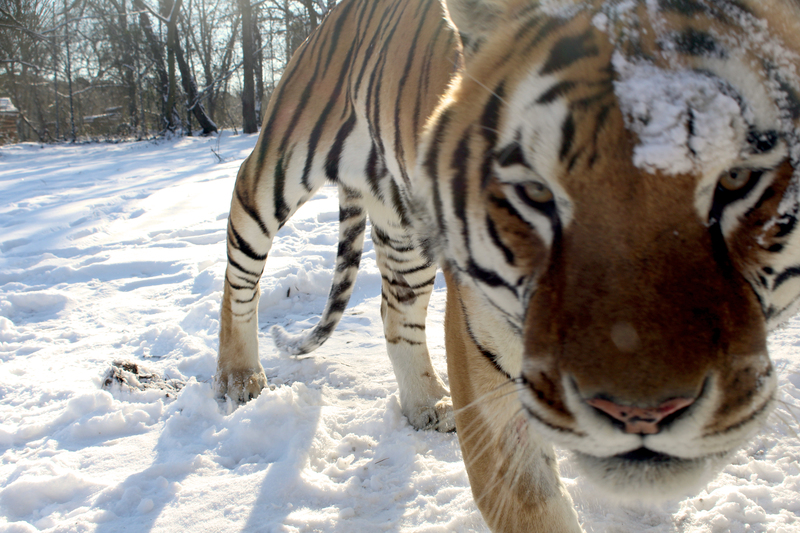 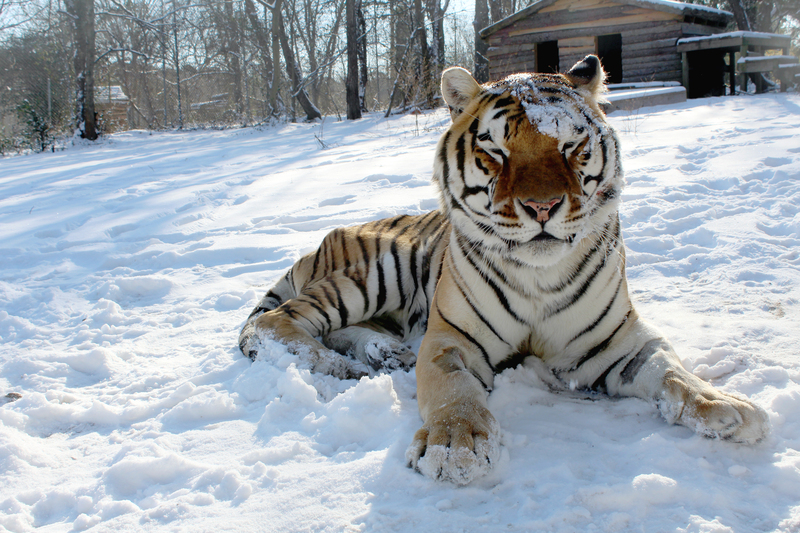 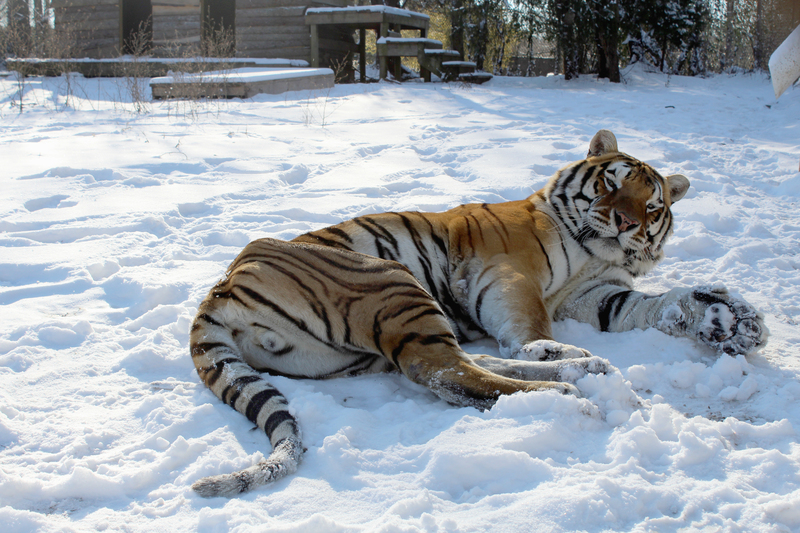 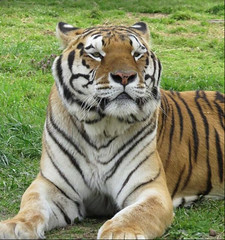 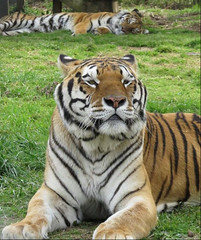 Caprichio came to Carolina Tiger Rescue with his enclosure-mates, India and Carolina, along with 13 other animals from a facility in Colorado. 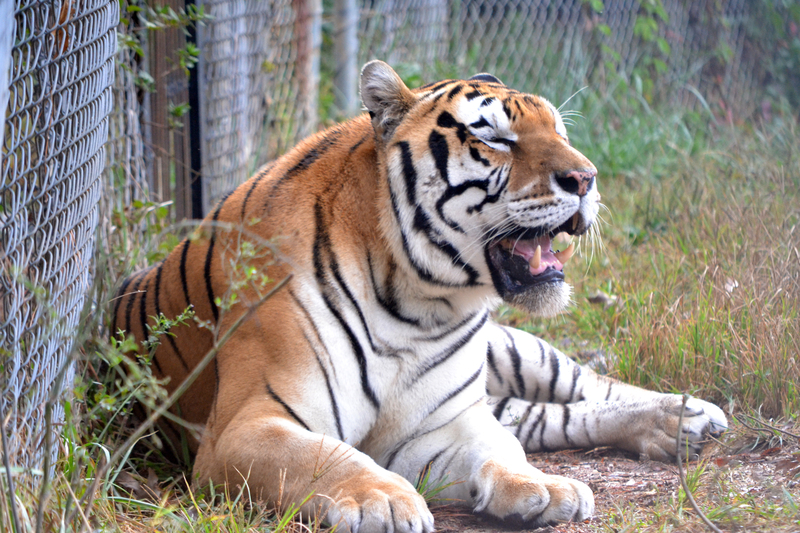 This facility closed down when the owner fell ill. Carolina Tiger Rescue worked with several other sanctuaries around the country to find homes for over 100 animals. 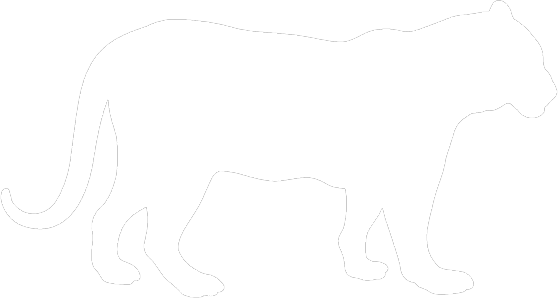 Despite his large size, Caprichio is a bit nervous around new experiences. 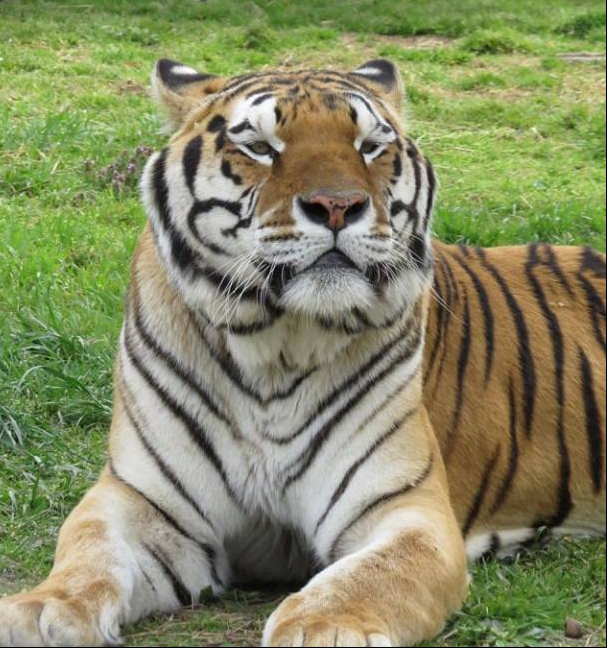 He tends to get a little anxious when he is not used to something, but, once he settles in, he loves to chuffle and show how content he is. 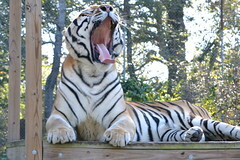 Caprichio loves to boss India and Carolina around and at times will roar at them, especially if there is food around. 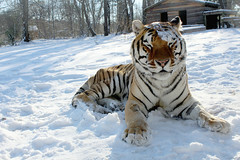 For this reason, he is fed apart from the girls. It certainly is not his fault, though; wild tigers are solitary and it is not in his genes to share. 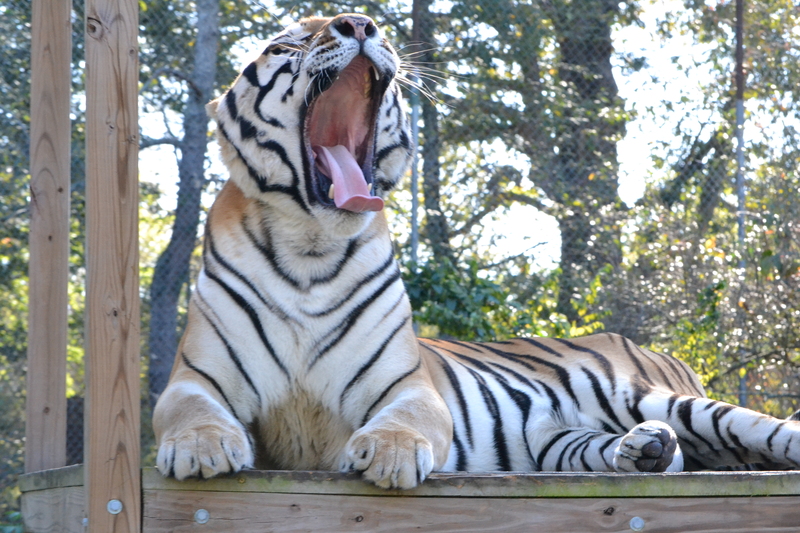 Caprichio is the largest tiger at Carolina Tiger Rescue currently weighing in at over 480 pounds. 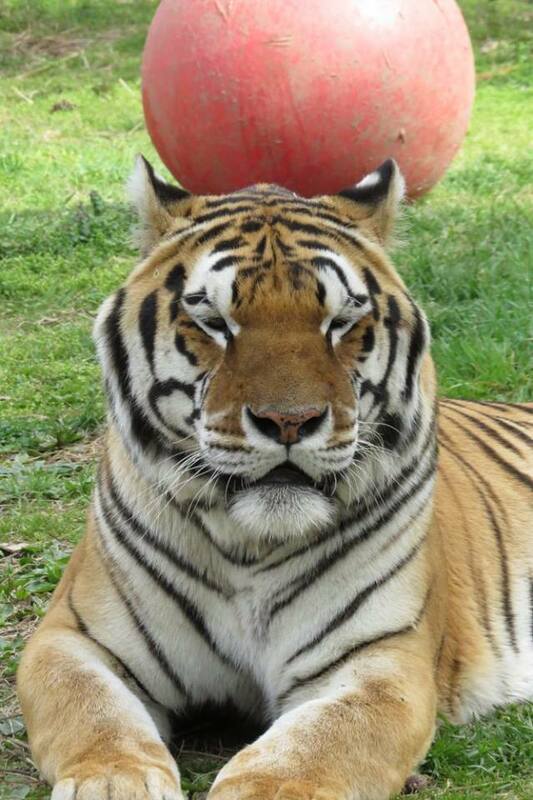 We have had some overweight cats before but Caprichio is all muscle! 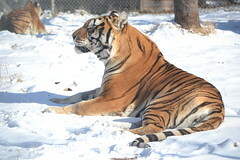 This big boy has a beautiful, bright orange coat and a head so large you can't miss it! Caprichio does have a bowed back leg that is likely due to malnutrition as a cub and he walks with a bit of a limp, but he does not let it slow him down! 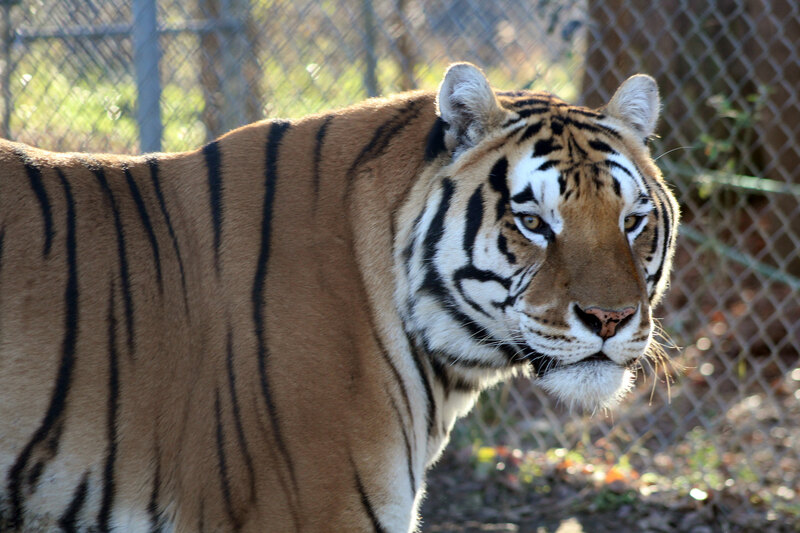 Caprichio lives on tour on Oak Hill with his enclosure-mates, India and Carolina Tigers. On one side is Rajah Tiger and on the other side are Sebastian and Sheba Lions. 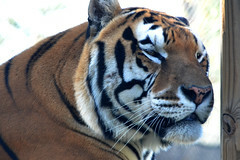 It is estimated that 1/3 of all land mammals will risk extinction by the year 2050 if the current trend continues. 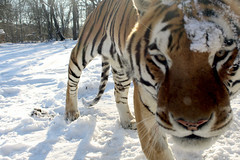 These animals are losing their habitats at an alarming rate. On average, 300 football fields' worth of rainforest is cleared each hour for palm oil plantations. 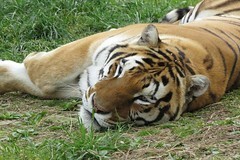 Palm oil is an easy and cheap crop to grow that is in over 50% of consumer goods. 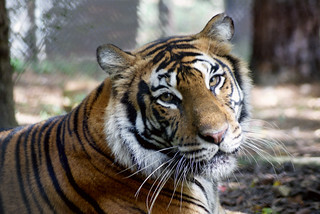 The area in which palm oil is planted is home to tigers, orangutans, and countless other species, big and small, that are vital to the Earth’s well-being.